We went to Batanes for a photo assignment at a time when Luzon and the Visayas were being battered by Typhoon Frank. Much of the island province's power was on a blink, not due to the weather, but rather from disrepair. So jocas, Seair InFlight's affable art director, and I hiked to Naidi Hills armed only with my headlamp. Funny, we lost our way and found ourselves right smack in the town cemetery. Not that I would shirk night-shooting there. so here's sharing a shot of the iconic lighthouse of Naidi Hills. I've always shot it in broad daylight so it's a blast shooting it at nighttime. Would've loved to do a longer exposure set but with the unpredictable power supply, it's a gamble I can't afford to make. Next time, I will. one astig shot bro! kakatuwa naman at sa libingan pa kayo nakarating. where does the light reflecting on the lighthouse comes from? sayang nga dom, i wasn't able to do really long exposures kasi brownout most of the time in batan. 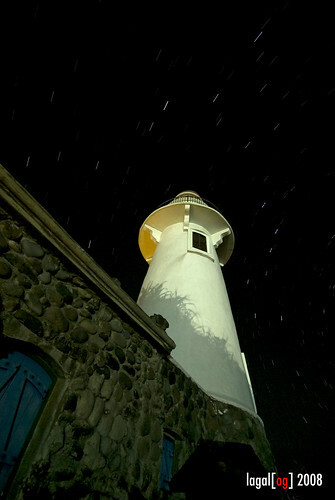 ambient light yung nagre-reflect sa lighthouse, coming from the parts of town na may ilaw. oo nga. pero maganda pa rin kasi may ilaw naman galing sa surroundings. that's the beauty of night photography dom. it shows familiar surroundings in a different light. yun lang, matakaw talaga sa baterya and matagal ang paghihintay - from the actual period of exposure tapos yung processing time.